Many Highland Scots, who had immigrated to America (primarily settling in New York and North Carolina) in growing numbers after 1745, generally supported the English Crown during the Revolutionary War. Having been defeated in uprisings backing the Stuart restoration in 1715 and 1745, the Scots were wary of rebelling against the monarchy a third time. Many of them were recently arrived yeoman farmers of modest means or moderately wealthy merchants and officeholders living near the seat of colonial government in Wilmington. This dependent situation in which the Scots found themselves contributed to their Loyalist tendencies, and they had little desire to see their trade as well as capital threatened by rebellion. With this in mind, Governor Josiah Martin wrote to the earl of Dartmouth in 1775 requesting that his relinquished commission in the British army be restored and that he be allowed to command a regiment of loyal Highland troops. In his response dated 12 July 1775, Dartmouth stated that the king would not allow Martin to be reinstated in the army but approved the raising of a battalion of Highlanders under Lt. Col. Allan MacLean. It was not until 10 Jan. 1776 that Martin finally issued the call to arms that would raise the North Carolina Highlanders. In light of Tory attempts to crush Patriot recruiting, MacLean assured Martin that the loyal Scots were rallying to the king's standard. The majority of these Highlanders came from Anson, Cumberland, and Bladen Counties, locations of heavy Scottish settlement. British general Thomas Gage sent Brig. Gen. Donald MacDonald and Lt. Col. Donald McLeod to rally the Scots in North Carolina, believing that they would contribute a considerable number to the British ranks. The regiment they were to raise to join the Royal Highland Emigrants was then to march to Wilmington and join the king's troops. At the same time, Martin was creating his own North Carolina Highland Regiment. Although unclear in the Colonial Records, it appears that the two groups consolidated into one battalion rather than marching separately to Wilmington. At Wilmington, the emigrants were to join the main body of British troops, while Martin's Highland Regiment was to stay in North Carolina to counter any actions by the Tory militias being formed in the area. On the march to Wilmington, the massed Highland army under MacDonald engaged Patriot forces at the Battle of Moore's Creek Bridge on 27 Feb. 1776. Despite the ferocity of their attacks, the Scots met defeat at the hands of North Carolina militia under Alexander Lillington, James Moore, and Richard Caswell. With this blow, Scottish resistance all but crumbled, with the victors confiscating Scottish firearms and broadswords and even carrying off the belted plaids of many vanquished Highlanders. Despite the outcome at Moore's Creek, Martin remained hopeful of leading a Scottish army. Residing in Charles Towne (modern-day Charleston) in late May 1780, he wrote to a Salisbury man named Weickerman that he "would be in Cross Creek [now Fayetteville] within a fortnight" at the head of Loyalist militia. In 1780 Martin raised a two-company battalion, the North Carolina Highland Regiment, for service. Scanty records survive of their activities, which most likely consisted of acting as a part of the Royal Highland Emigrants. The commander of the Highlanders was Lt. Col. Samuel Bryan. In 1782 the Highlanders were sent to New York to become a brigade in the British army, and in 1783 they were disbanded in Canada. Wallace Brown, The Good Americans: The Loyalists in the American Revolution (1969). Stuart Reid, Eighteenth-Century Highlanders, Men-at-Arms series no. 261 (1993). 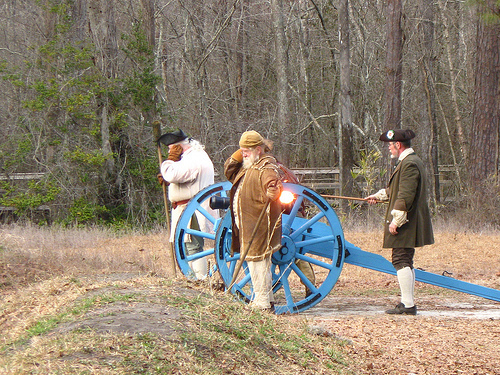 Firing the cannon during re-enactment of Battle of Moore's Creek Bridge. Uploaded from Flickr user Seuss; image uploaded on February 28, 2010, available from http://www.flickr.com/photos/90124154@N00/4397087852/ (accessed May 14, 2012).